BFUHS Jobs Recruitment Notification 2019.Baba Farid University of Health Sciences inviting applications for the positions of professors, associate professor, assistant professor, senior resident, junior resident, emergency medical officer, medical record officer, director etc positions.Interested and Eligible candidates can apply for the positions. Last Date for Submission of Application is on February 20th, 2019. 173 empty positions to be filled through Baba Farid University of Health Sciences Notification on regular basis for a tenure of 3 years. Vacancies list is as follows. Candidates can all the details link eligibility criteria, salary, selection and added information contenders can look into the official website. Candidates interested at www.bfuhs.ac.in recruitment 2019 can apply through OFFLINE mode. As per the notification the due date to send application form is 20th February 2019.
http://bfuhs.ac.in is the link from which candidates can download application form and send to below given address. 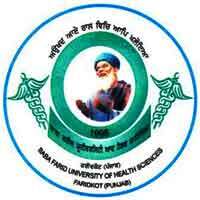 Baba Farid University of Health Sciences, Sadiq Road, Faridkot (Punjab)- 151203.